Nitric Oxide Booster! Increase Athletic Performance & Sickening Pumps! Nitric Oxide Booster! Increase Athletic Performance & Sickening Pumps!Nitric Oxide Booster! Increase Athletic Performance & Sickening Pumps! What exactly is Blood Bath? Is it a bath thats filled with blood? Is it something nasty, disgusting, sick, painful? Well its not technically a bath filled with blood.. Just whatever you happen to be training will be filled with blood. A sports nutrition supplement that falls under the preworkout category. How does this product work? Pretty simple, yet sophisticated. It has a bunch of ingredients in there at the most optimal dosages to increase vasodialation. This in turn aids in nutrient delivery. With increased nutrient delivery you can expect to grow more rapidly. Your muscles will be getting fed faster with whatever nutrients you put into your body. You can expect an insane amount of blood forced into whatever it is your training which also aids in muscular growth. This helps expand muscle tissue, ripping the tissue, creating room for new muscle to form as long as you feed the muscle what it needs. Why would you take this? Many people are looking for a pre workout that will aid their training or athletic goals. Those same people may not want stimulants (energy) for various reasons. Thats the beautiful part about blood bath. It has ZERO stimulants! This means you can take it before bed, take it with other supplements, take it as a sports drink during your basketball, football, baseball, croquet, or chess game (only if you are an EXTREME chess-er) or even a triathlon. You could also stack it with our Meth Lab for the most optimal performance you will ever experience. Who can or should take BloodBath? Anyone.. Unless you have heart issues and you are on Dr. prescribed nitrates or blood thinners. Its perfect for any athlete, in any sport, to help push each person's optimal physical performance. Freer flowing blood with more oxygen and nutrients delivered through the blood stream allows for a better peformance in any activity that you partake in. When should you take this? Anytime. Seriously. Recommended to be taken 20-30 minutes prior to exercise for increased vasodilation and athletic performance. You can also take it with any meal to aid in nutrient delivery, during any physical activity or training to help peak performance, or even post workout and after physical exercise to help rejuvenate your body. It depends on your purpose for taking Blood Bath. If it is for painful pumps and to blow up like a balloon during your training session or perform better, then take it before training. 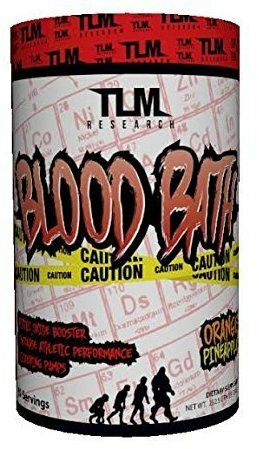 1250 Mg of Agmatine Sulfate, Citrulline Malate, L-Norvaline, L-Arginine, Ornithine, Vitamin B-12: These are the main ingredients in Blood Bath. All ingredients dosed high to allow the consumer to get the most out of 1 scoop. Other pump products on the market have enough of certain ingredients to allow you to take 3 scoops to get close to the same results you would get with 1 scoop of Blood Bath. This means Blood Bath is a true 1 scoop pre workout will last you 30 servings as most other pump pre workouts that are 30 servings really end up being 15 or 10 servings... But not anymore. The time has come where Pump City is here and the ticket to get there is in TLM Research Blood Bath. Think about it. Pump city... 1 scoop away... what are you waiting for? What exactly is Blood Bath?What exactly is Blood Bath? How does this product work?How does this product work? Why would you take this? Why would you take this? Who can or should take BloodBath? Who can or should take BloodBath? When should you take this? When should you take this?